Gun enthusiasts have long been a resourceful group – we enjoy working with our hands and we take pride in the work we accomplish. To that end, nothing speaks more highly of one’s dedication than assembling your own rifle. The modularity of the AR-15 platform allows you to not only build your own weapon, but to build one that is custom tailored to your preferences (what you like) and application (how you will use it). Del-Ton’s rifle kits are the perfect place to start. These kits include every part you need to complete your own AR-15 (except the lower receiver and a magazine). One of the best features of the AR-15 is the modular design which allows you to buy each piece at a time if you cannot afford to do it all at once, or to choose and select from different sizes or features to custom build your ideal rifle. The basic design lends itself to modifications that can be easily done and allows for pieces from different manufacturers to be incorporated into the overall structure. The AR-15 is a hugely popular platform for both novice rifle users and experienced firearm owners who are in the market for a close to medium range tactical rifle and want a dependable semi-automatic weapon. It can be used for anything from plinking and target shooting to hunting and it excels as a defense oriented/tactical long-gun. The original and most popular caliber in which the gun is chambered is 5.56 X 45 NATO (.223 Remington). All Del-Ton weapons are chambered in 5.56 X 45. The AR-15 rifle kits available at Del-Ton are available in both 16” and 20” barrel lengths and include everything you need to complete a fully functional AR-15 except for the stripped lower receiver and a magazine. Many parts in the kits, such as the bolt and carrier and lower parts kit, are customizable--allowing our customers to choose various "upgrade" parts from some of the most in demand manufacturers of AR-15 products. These selections are available in the drop down menus on the product page of a particular rifle kit. This provides the opportunity to build a rifle that will perfectly meet your preferences in form and function. These items are also offered at a discount from their typical retail price, when purchased as an upgrade to the rifle kit, saving you money. If your mind isn't made up just yet, a basic model will do just fine; that is the beauty of this weapon--you can modify it as your needs or mission change. While we already mentioned the weapon's modularity, there are many other unique and beneficial features to the AR-15. 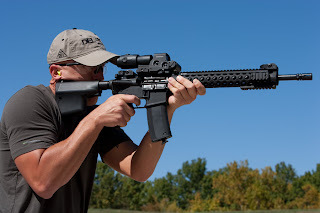 Easy to control during rapid fire, the AR-15 is comparatively light in regard to recoil. Smaller framed users will not find the weapon intimidating to fire. The AR-15 seems almost impervious to the elements – it can withstand rain and humidity and fare better than most other rifles on the market. It is also easier to clean than many other semi automatic rifles, in that the upper half can simply be disconnected via two pins. This allows a thorough breech to muzzle cleaning without concern for solvents and oils entering the action of the weapon. Parts and replacements for the AR-15 are easy to find and no other weapon platform has such a variety of aftermarket parts available. The AR-15 is almost infinitely adaptable, allowing you to exchange pieces and upgrade parts over time to create ever new versions of the rifle that meet your changing needs and application. Modern guns and rifles have an impressive ability to withstand the stresses of being fired hundreds to thousands of times and they handle the thousands of pounds per square inch (PSI) of pressure that is generated when the gun powder burns but they are still at risk for humid environments and dampness. Humidity can cause rust and other damages to guns and rifles, including malfunctioning equipment. Rust can occur inside gun barrels and elsewhere on metal portions of the gun or rifle (depending on the model). Although some modern models include stainless steel pieces, older vintage and classic guns may feature iron accents. Iron and any ferrous alloy are prone to rusting so it is necessary to take steps to avoid this. 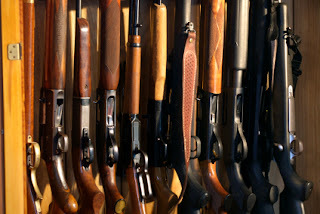 Once rust has occurred it renders the gun or rifle essentially unusable so it is important to take precautions to avoid storing your guns and other arms in areas that are likely to increase in warmth and/or humidity – such as a laundry room or any area near or adjacent to a kitchen or bathroom. For those living in particularly hot, humid states – such as Texas, Georgia, Louisiana and other Southern states – it may be beneficial to purchase a gun closet or vault for storage. Consider purchasing some of these tools and products to decrease the potentially hazardous impact of humidity on your gun collection! 1. Dehumidifier: Best placed in the room or closet wherein your guns are stored. If you live in a particularly humid climate and have a walk in gun safe then this option may be better for you. 2. Desiccant Devices: These are the small pouches of silica gel found in new shoes and clothes, which absorb moisture. 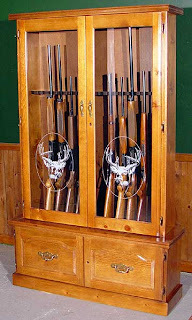 Larger versions are available for about $3 and are specifically designed for guns and gun storage. They last for several months during the summer (depending on environmental humidity). Include some of these in the gun safe or wherever you store ammunition. 3. Dehumidifying Wands: Under $50, these items are basically small heaters designed to be mounted near the bottom of a gun safe to keep moisture from building up inside the safe. Place one inside your gun safe or closet. 4. Temperature-Controlled Safes/Vaults: This is the most expensive, but most effective, options. Temperature-controlled safes offer not only the option to set your humidity and temperature levels, but combine it with the safety and security of having a locked storage location for your arms. The optimal atmospheric condition for most guns and rifles is 70 degrees Fahrenheit with humidity levels around or below 50%. Implementing humidity reducing products in your gun storage and maintaining a steady, cool temperature will ensure that your guns and rifles remain in good condition and function well for a long time!